It’s an old rusty oven tray you don’t like me to use anyway. No food was in the oven at the same time, not that that would really matter as I was only evaporating the water off them. 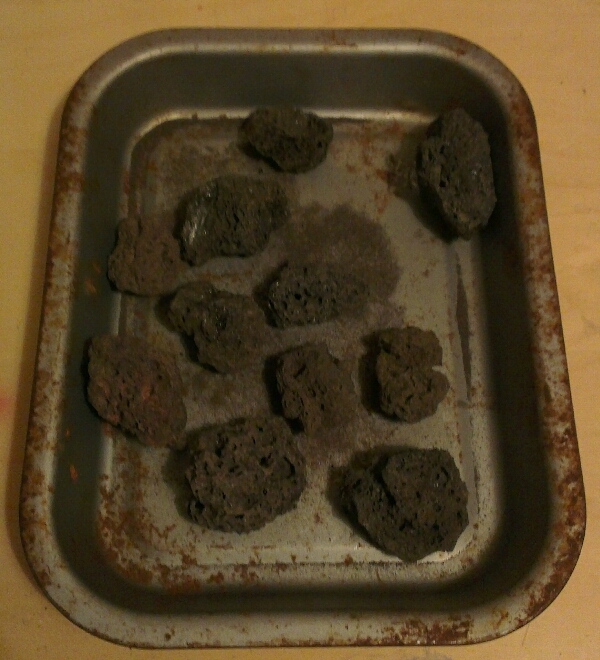 The oven wasn’t left on to dry them, as I was just using the residual heat of the oven after finishing cooking. She would never have known if I hadn’t forgot to take them out after they had cooled off. I am in the process of making some asteroids for X-Wing, it’ll make its way into an article on here at some point. I’ll be making the asteroids out of lava rocks, you know the ones for gas barbecues, I bought a cheap 1kg bag of them during the summer from the supermarket. They have been in the garage since then waiting for me to do something with them. A couple of the guys at the club are planning on running an escalation X-Wing league over the next 3 months so I figured I’d go and make the asteroids for that league. I opened the bag the other day and found that it had a lot of condensation on the inside and the rocks were damp. So before I even started to glue or paint them I needed to dry them out. Hence Oven-Gate and the mysterious oven tray of stones. I am making out like the wife was mad with me, she wasn’t really. I just got that roll of the eyes, shrug of the shoulders and shake of the head that means she just finds me and my little schemes amusing at times. So folks what is the strangest hobby related thing that your wife/husband/partner/significant other has caught you doing? *Although in our household I am not the only one to achieve this feat of ingenuity. As my wife has once super glued her fingers together. She was trying to fix her fake finger nails back on (I am sure there is a technical term for fake finger nails that has escaped me) and stuck her fingers together. For a while she was adamant that she was not using super glue but she was in fact using finger nail glue. Until I went and pointed out the ingredients list on the bottles, the latter having an additional pale pink colouring. Maybe I should have waited until after freeing her fingers for me to prove that point? This entry was posted in Waffling Verbage, Warmachine & Hordes and tagged modelling, X-Wing. Bookmark the permalink.